Our first morning on the South Island! We had really been looking forward to this part of the trip; the North Island is beautiful, and the people are really nice, and it is a great place for horses and Eventing. But the South Island, that is where the wilderness is! Ready to set forth, we threw our bags in the back of the SUV (once we got it open with the key, that is, since we still couldn’t locate the release switch), had a good swaaaaarrkk with the windshield wiper to indicate a turn, and headed off to the mountains! The billboard as we left Darfield said “Arthur’s Pass: Road Open”, we took this to be a good sign. It was a beautiful sunny morning. We went along the Waimakariri River, its criss-crossing streams spectacularly encased in a wide valley lined with golden-yellow broom. We followed the West Coast Road, and soon we were climbing; first foothills and then mountains, increasing in size and ruggedness. 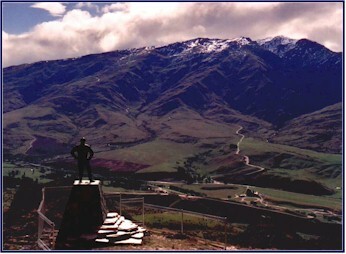 Before long we were in the midst of the Southern Alps, the magnificent ‘continental divide’ mountain range that runs down the center of the South Island. The road was good, but quite steep and winding. 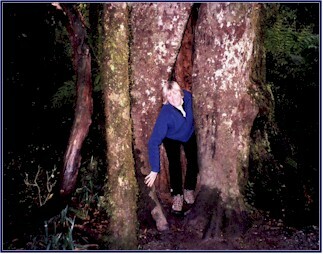 It was evident that there were no fewer possums here than on the North Island. Why did the chicken cross the road? To show the possums it could be done! Even though this was a fairly large road (at least for NZ!) and the major east-west route, there were many one lane bridges, often quite long; this always caused a moment of confusion as to who had the right of way. We passed several signs graphically warning of the dangers of going too fast on these mountain roads. “The Quick ARE the Dead!” one billboard proclaimed. But they needn’t have worried about me speeding through these mountains; I was one of the slowest drivers on the road, taking my time in order to enjoy the incredible views and stopping for photos at every scenic overlook. We passed an area called Castle Rocks Station; the name was befitting as the huge and unusual rock outcroppings looked like ancient castles on the mountainside. We went by several ski fields; skiing is quite a popular activity on the South Island. We turned on to a small side road with a sign that said ‘fine weather road only’ and drove around the edge of Lyndon Lake. 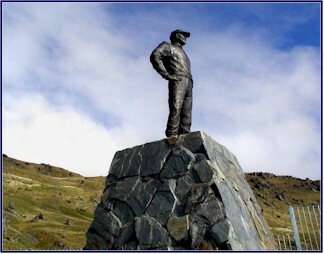 Returning to the main route, we continued on to Arthur’s Pass, named after Arthur Dobson who discovered it in 1864 during the Westland gold rush. We stopped at the information center for advice on where to tramp. We were a little appalled to see several tour buses in the parking lot, with crowds of people pouring out of them. We were aware that New Zealand has a booming tourism industry, and they especially get busloads of visitors from Japan; but we had so far managed to avoid the busier tourist spots. Fortunately, once we left the information center we didn’t see much of the tour bus crowd. Apparently in an effort to cover everything, the buses arrive at a location, everyone piles out and takes some pictures, walks around for a few minutes, then piles back on to the bus and off they go to the next spot. We could not imagine a worse way to experience New Zealand! Several keas greeted us in the parking lot. A kea is a type of parrot that lives in the Southern Alps. They are quite pretty; a muted green color with some blue feathers, and with red underneath their wings, visible when they fly. They have become quite bold, and they meet the tour buses at the information center to beg for food! Jineen fed one of them a few leftover French fries, which he took straight from her hand, before we were admonished by park staff not to feed the keas. The Department of Conservation asks hikers to fill out a card outlining where they plan to go, and file it at the information center. When you return from your tramp you check back in and remove the card, so they know you have not been engulfed by an avalanche, flash flood or sudden snowstorm. If you don’t come back then they know where to search for the bodies! Somewhat dismayed by all of these possibilities, we asked the guy working there for a nice easy hike that would take a few hours, show us some nice views, and bring us back down safely. He recommended Scott’s Track, and said it was the easy way up to Avalanche Peak (a 6 hour tramp!) but that even if we only went part way we would have a nice hike with lovely views. Sounded good to us! He told us it was going to rain on our hike; we told him that our trip was charmed and it wouldn’t! First we took the short walk to the Devil’s Punchbowl. With a name like that, how could you resist? 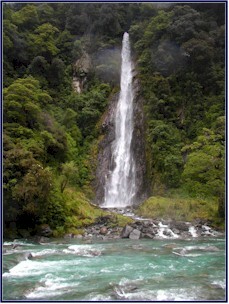 This was a spectacular waterfall that cascaded down from a great height into a pool below. 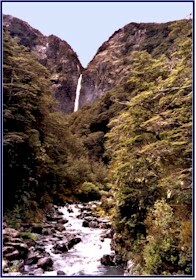 We walked to a narrow bridge across a stream, where we had a lovely view looking up at the falls above us. The rest of the trail was closed due to avalanche damage. Then we headed up Scott’s Track. We found the start of the trail by the road and immediately began to climb straight up. The path followed a stream up through the forest and was very steep the whole way. Soon the trail was actually in the streambed itself, and we clambered up the rocky gulch, going ever higher and higher. Often the way was so steep that we had to climb it like a ladder. Nice easy hike indeed! The good news was we didn’t have to worry about the trail being busy or crowded. Those people from the tour buses weren’t going to come up here! It reminded me of a hiking experience I once had on a volcanic island in the Caribbean. Our guide there had told us that for the 3 hour hike we were doing, the first hour would be level, the second hour was uphill, and the third hour downhill. When we set out, we immediately started up a sharp incline, and continued to climb up a steep grade. When we asked our guide about it, pointing out that he had told us the first hour would be level, he replied, “Oh, compared to the second hour, this IS level!” And of course, he was right. Not that we were complaining (well, maybe a little). As we progressed up the mountainside we were amazed, looking back, to see how far we had come. Soon we were well above the Devil’s Punchbowl Falls; we could see the expanse of mountain above it that had been hidden before. Several other waterfalls came into view as we went higher. The tops of the further mountains were enshrouded in clouds. It looked like it could rain, but it didn’t. The trail climbed through the forest; it was peaceful and beautiful. The trees were covered with moss, and the forest seemed magical. Everything was very quiet; we could hear the wind and the water and the birds. At one point we heard the most beautiful clear ringing birdsong, but we had a hard time locating its source. When we finally sighted the singer, it was a very unimposing little green wren-like bird, which we later learned was called a bell bird. After hearing his song we could understand how he came by the name! It seemed like we climbed for hours; in fact we did! The hike was quite difficult and tiring, but also very rewarding. We reached a ridge where we could see Avalanche Peak, still well above us. We came out into the open above the treeline and close to the snowline; we had incredible views in all directions. It was quite cold this high up, and the wind was strong, but it didn’t rain; we watched the clouds rolling in and out dramatically. 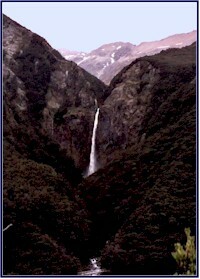 Looking down, the waterfall was now far below us, and we could see the roadway winding down the valley like a ribbon. We were so high it was like looking out of an airplane. We couldn’t believe how far we had climbed; it felt like we were on the top of the world! We met up with 3 guys who were hiking the whole Avalanche Peak loop; they had come up the other side (the hard way! ), and were now heading down Scott’s Track. From their description, we realized that we really had come the easy way, compared to the trail they had climbed. They were sitting on some rocks eating their lunch; we realized what an oversight it was not to have brought any food in our backpack! Definitely a mistake we wouldn’t repeat. I had bought a new camera right before the trip; one that is small enough to take hiking, with a good zoom lens. I love photography, and usually end up taking way too many pictures! It was interesting to take photos of the Devil’s Punchbowl from different perspectives; first from the bottom shooting up at the falls, then looking across the valley at them, and by the time we reached the top, photographing them far below us. 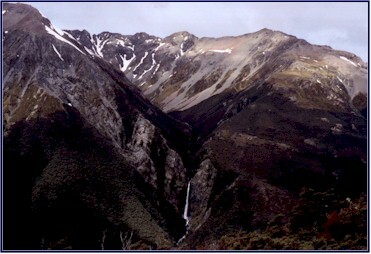 The Devil's Punchbowl Falls from three perspectives. We continued on a bit further, but by now our legs were starting to feel weak from the exertion of the climb and we were running out of energy, so we turned back. We would have liked to have gone all the way to the Avalanche Peak summit, but we didn’t have another hour and a half of uphill left in us! The trip back down proved to be just as hard as going up. It didn’t take as much energy and we weren’t as out of breath going down, but it was very strenuous on the leg muscles and our joints were aching. Soon our legs were trembling from the exertion. Both of us were very happy with our comfortable new hiking boots; but by the time we reached the bottom we had been going on rocks for almost 4 hours, and our feet could definitely feel it! About the time we returned to the car park it started to rain; we congratulated ourselves on our excellent timing as we partook of some bread, wine and map reading. We opened one of the bottles we had bought at the wine shop in Tirau, the Belmonte Chardonnay, and sampled it, using two small wine glasses that we had “borrowed” from the plane on our flight to NZ. It was good but a bit bland, we gave it two stars. But more importantly, we had initiated Happy Hour; an excellent policy that we put into effect for the rest of the trip! Then we headed for the west coast. We continued to see very dramatic scenery, but the road was treacherous in places. One sharp bend with a scenic overlook of the Otira Viaduct was graphically named ‘Death’s Corner.’ It had a fabulous view, and a sign that said, “Do not feed the Kea.” We saw incredible slopes of loose rock and scree, probably the result of landslides and avalanches. Everywhere we looked there were waterfalls, many of them hundreds of meters high, formed from the melting snow that was still present on the higher peaks. As we descended from the mountains we came to peaceful green farmlands. We had several nice bird sightings. A weka crossed the road in front of us; this is a small flightless bird that looks somewhat like the elusive kiwi. A bit further on, we saw next to the road a large blue and black bird with a red beak; it was a pukeko, and we saw many more of these attractive birds along the way. We continued on the scenic route to Greymouth, and it rained steadily. We felt ourselves very fortunate; we knew that the western side of the South Island got a lot of rain, so we weren’t going to escape precipitation altogether. But now that our tramp was done, this was a perfect time for the rain to come! The wind really picked up, and by the time we reached town it was blowing like a gale. We rolled into Greymouth and found lodging for the night at the Kiwi Palms B&B, right in town. Our room was large and comfortable, but the house didn’t have the friendly, homey atmosphere of the other places we had stayed. A large life-size statue of a seaman standing in the hallway startled us each time we came out of our room. The proprietor recommended a restaurant called Trawlers; we found it after 3 laps around the Town Center and an abrupt left turn when we finally spied the entrance, and even then we ended up coming in the back door! We had some nice seafood, though the selection was limited; for a country with so much coastline, we had found it surprisingly difficult to find good fresh seafood! (We later learned that this is because most of the best seafood is exported.) I enjoyed sampling Monteith Beer, a very good beer from the local brewery. I was awakened in the night by a loud rumbling noise and a sense of motion. I had read that New Zealand often had earthquakes, and now I felt everything in the room rattling and shaking! I was really excited, as I had never experienced an earthquake before; but then I realized that it wasn’t a quake after all, it was a passing train. The Kiwi Palms sits right by the railroad tracks! We started off the day at the grocery store, one of the few we had seen, where we stocked up on food and wine for picnic lunches. We were going to be better prepared for our next tramp! We left Greymouth and soon came to the shore of the Tasman Sea. The beach consisted entirely of many different types of stones, all worn round and smooth by the sea. It was cold and windy, and the surf was very strong. We walked along the deserted beach collecting stones. I have this habit of bringing back rocks from wherever I travel; I have a collection of them from all over the world. There was great variety here; translucent white ones that were almost perfectly round, and brown and gray and green ones of many varieties. We found some that consisted of greenstone, or New Zealand jade. I picked up far too many, planning to sort them later and decide which ones to keep. We took Route 6, known as the Glacier Highway, and followed the coast. Sometimes the road went right by the water, and other times it was high up on the shoulders of the mountains. We saw large herds of elk grazing in fields, right along the ocean. We found this amazing; in most places in the world beautiful coastline like this would be full of resorts, hotels and houses, here it was wapiti pastures! We had seen a lot of long one-lane bridges even on main roads all over NZ, but in this area they had a new twist; they were shared with the railroad tracks. So when we came to a narrow bridge spanning a wide river gorge, we not only had to pause and make sure a car wasn’t entering the bridge from the far end, but we also had to look out for trains! We came to the town of Hokitika, where we stopped at a glowworm dell. It was a little dimly lit hollow where a small stream trickled from the side of the hill, and it was home to thousands of glowworms, who dangle little strings of luminous material as bait to attract the tiny insects which they feed on. Unfortunately they are best viewed at night, so in the daylight we could only get a faint glimpse of them. We stopped in a jade shop, where the owner gave us a personal tour and showed us how he fashions the greenstone into jewelry and carvings. He explained that you have to be quite careful shopping, as some stores will try to pass off less valuable Chinese jade as New Zealand greenstone. It was interesting to learn about the craft from a master, and Jineen bought a beautiful greenstone carving for her mother. We also noticed a shop that specialized in gloves and other items made from possum fur; the sign on the front of it proclaimed: Possums – More than just Roadkill! Next we visited Eco-world; this was an indoor exhibit of native NZ wildlife. I don’t much like zoo-type atmospheres, but we figured it was going to be our only chance to see a kiwi so we stopped for a look. The kiwi is exclusive to New Zealand, and is used as the symbol of the country and the nickname for the NZ people. Unfortunately these flightless birds are now an endangered species, and unlikely to be seen in the wild. Eco-world had a nocturnal exhibit of kiwis in their environment; we sort of dimly got a look at one in the near-dark enclosure. Supposedly there were 4 of them in the large cage, but we only ever located one. They also had a couple of live possums; this was a novelty as we were used to just seeing them dead along the side of the road! We were working on our Kiwi accents. They use many terms that are different from what we are used to: hiking is called tramping, roads are sealed or metaled rather than paved or gravel, and if you were driving really fast then you were going flat chat. But we really liked the way they pronounced some of the regular words. A description they used often was ‘cool,’ which had the same context we would use it in, but they pronounced it with a very hard K sound, and almost drew it out to two syllables, so it sounded sort of like “kuh-ool”! We practiced this pronunciation, but had a hard time getting the inflection just right. Towns of any size were few and far between. We had quite a good detailed atlas-type map of NZ that we had bought at the airport, and it showed all of the little back roads and even some of the tramping tracks. There were many towns indicated on the map, but when you drove by them they were often so small you couldn’t even tell they were there. It was impossible to tell from the map which towns were large enough to have, say, a petrol station! One thing we learned quickly was to fill our tank when it got anywhere close to halfway, because gas stations were quite scarce. We were just entering the town of Ross, which was in fact big enough to have a store and a petrol station, when a policeman stepped out into the street in front of us and waved me over to the side of the road. Oops, we have a speeding ticket! This was a little ironic, as most of the trip I had been driving much slower than everyone else on the road; but one of the few times I exceeded the speed limit I got caught! He told me it was a $300 fine; but not to worry, since I was a visitor I didn’t need to pay it, I could just ignore it. Kuh-ool! You’ve got to love New Zealand! 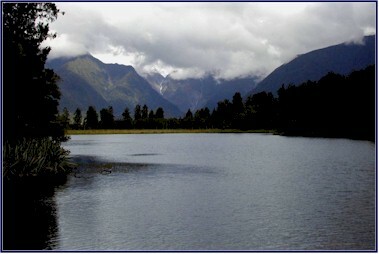 We drove along the shore of Lake Ianthe, a large deep blue lake right by the side of the road; and presently we came to the Whataroa River, another of the braided rivers. It was a distinctive greenish-blue color, but as we were nearing the glaciers it had somewhat of a chalky appearance, sort of a milky green. We learned that the color of the rivers and lakes on the South Island comes from minerals and fine particles of rock that are ground up by the glaciers and suspended in the water. The results are quite stunningly beautiful; almost every stream, lake or river we saw was a brilliant color, with varying shades of blue, green and turquoise. Once again, we were lucky with the rain on this day. 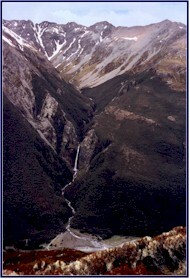 The west coast of the South Island is the wettest area in NZ; the annual rainfall is often measured in feet rather than inches. It showered on and off throughout the day, but it really only rained when we were in the car, and always stopped when we came to a place where we wanted to get out and explore. 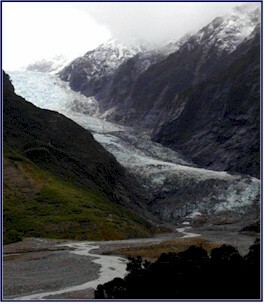 Before long we came to Franz Josef Glacier. The glacier was impressive, especially since neither Jineen nor I had ever seen one before, and the surrounding mountains were beautiful; but it turned out to be a very touristy spot, with dozens of tour buses and a crowded parking lot full of visitors. We took the short path to a lookout with a good view of the glacier, and we walked out onto the wide riverbed below it; but we didn’t stay long because there were so many people about. As we left the glacier area we had a nice view of Mt. Gunn, a high jagged snow-covered peak. This was one of the filming sites for the “Lord of the Rings” movies; it was one of the peaks they had used for the ‘Lighting of the Beacons’ sequence. Looking up, it was an impressive sight; you could really imagine a huge bonfire blazing forth from the top. Our first LOTR sighting! Although we hadn’t really planned on visiting the movie locations, since arriving in NZ we had found that just about every map showed them and many brochures mentioned them for advertising. In fact, our atlas map featured the filming sites marked with little gold rings. Apparently even New Zealand is not above cashing in on a bit of massive commercialism! Next we drove to Lake Matheson, where we took a short hike around the edge of the lake and crossed over a wooden bridge to ‘Reflection Island’, a lovely spot that boasts a view of Mt. Cook on a clear day. It wasn’t visible that day, but we did have a beautiful view of the mountains across the lake, their peaks obscured in cloud. As we walked back around the shore we watched as Cone Rock, a small conical peak that stood in front of the mountain range, faded in and out of sight in the moving mists. 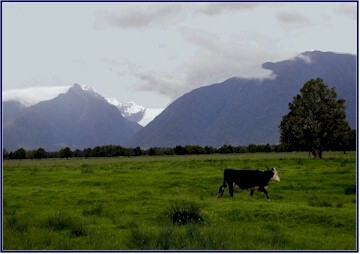 Presently the mist lifted, and we had a nice view of Fox Glacier in the distance, with cows grazing in the foreground. As we stood watching, a sudden rainstorm came moving down the valley towards us; we could see the dark cloud approaching, and silver rain slanting across rays of fitful sunlight. With our customary good timing we made it back to the car just as it began to pour, and we sat out the shower while enjoying Happy Hour. We sampled the Landmark Estate Gisborne Chardonnay; fresh but a little disappointing, we only gave it one star. We went in search of seals. Our map showed a Seal Colony some way up the coast, and this piqued our interest. We talked to a guy who surfed at nearby Gillespie’s Beach; he said he often saw seals there so we went to check it out. When we arrived at the small parking area, we found a very non-scenic path that led through a dense thicket of gorse and large shrubs. It ran parallel to the beach; we could hear the surf but couldn’t actually see the water. The wind was quite strong and it was starting to spit rain. After about a half hour we finally reached an opening where the path came out to the ocean; the surf was very intimidating, with the waves crashing onto the rocky beach with amazing force. We couldn’t imagine surfing there. No seals. It was not a particularly pleasant spot, and we headed back. Being low on fuel, we stopped at the gas station in the town of Fox Glacier; and we got there just in time to purchase the very last bit of fuel they had! This was very fortunate, because as a big sign at the edge of town proclaimed, it was the last petrol for 120 kilometers! We had other good fortune as well; while I was pumping the gas Jineen found the elusive rear-door release button on our vehicle! It was cleverly hidden up under the handle on the driver side door. Now we could open the back of the car while the engine was running! We drove up a small side-road to a viewpoint for Fox Glacier. It was much less crowded than Franz Josef, though that may have been because we were there quite late in the day and because we avoided the main parking area. From our lookout spot, framed by trees, there was a lovely view of the glacier; it was surrounded by impressive snow-capped mountains, definitely ‘Beacon’ type peaks. By this time it was getting well on into the evening, but we weren’t tired and we wanted to be in Wanaka the next day, so we decided to put some miles behind us. We headed south, and it was a great drive; scenic and peaceful. I got into a sort of driving zone, and the miles sped by. That time of evening the road was practically deserted and we made very good time; though being careful to avoid more speeding tickets! The scenery was lovely. The setting sun was peeping in and out of the scattered rain clouds as we passed along by the Karangarua River; we looked across the green fields and saw a double rainbow. We drove by Bruce Bay; a beautiful deserted beach on an empty road, along the Tasman Sea. The incoming waves were breaking far from the shore, three and four deep. We were starting to get a little bit worried about lodging for the night. Our usual plan was to see where we found ourselves at the end of the day, and then find a room before going to dinner. We had rented a cell phone at the airport, which on the rare occasions that we were in a service range was very useful to call ahead for a room; but this was not such an occasion and we had no signal. We were driving much later into the evening than usual, and we were becoming concerned that everything would be closed by the time we got to the town of Haast, our target destination for the night. We decided that we would stop at the first place that had a vacancy. One of the many nice things about New Zealand is that there is hardly any litter or trash along the roads or trails. I think this reflects the pride that the NZ people have in their country! We had also found that all of the roads, tracks and parks were quite well-maintained and user-friendly. The Department of Conservation does their best to preserve the wilderness while also making it accessible for people to enjoy. We pretty much had the road to ourselves. We saw many birds; including seagulls, swans, and pukeko. At one point a deranged stoat (a type of small weasel) ran down the road in front of us in frantic serpentines; it was panicked and couldn’t decide which way to go. Other than that, we hardly saw a soul; unless of course you count the dead possums along the road, these were plentiful! We went along a stretch of road that was right beside the ocean. The waves washing up on the shore reflected the colors of the sky, and sparkled in the radiance of the setting sun as it broke free of the clouds and cast last long rays of golden light. We continued on into the gathering darkness, and the night fell around us. We passed a place called the Wilderness Lodge, but it was full; we thought that was a bad sign. As we went on, every motel or B&B we passed was full; the No Vacancy signs were becoming an alarming omen. Before the trip, I had asked a number of people who either lived in NZ or had traveled there if we would have any trouble finding lodging on the spur of the moment if we didn’t book ahead. Everyone assured us that it wouldn’t be a problem; it was the New Zealand way. But in some areas, we were finding it to be not as easy as we had hoped! But finally, just as we were getting truly worried, we arrived at Haast and came to McGuire’s Motel, where we were able to rent their last available room. By now it was almost ten o’clock; fully dark, and very cold and windy. We hadn’t had dinner yet and their restaurant was about to close, but the proprietor kindly ordered us up a batch of fish and chips, which proved to be up to the high NZ standard we had come to expect. After dinner, we opened a bottle of Stoneleigh Sauvignon Blanc and partook, while we sorted our stones collected from the beach that morning. (Was it really only that morning? It seemed like much longer!) Happily anthropomorphizing, we envisioned the despondency of those stones that were culled; it made it hard to leave them behind. But with our baggage overweight excess firmly in mind, we ruthlessly chose the best ones to accompany us, and set the others free in the parking lot. I left one smooth translucent white one on the nightstand, as a tip for the maid. In the morning, having the rarity of a phone in our room and knowing the general vicinity of where we were going to be, we called ahead and booked lodging for the next two nights. The hotels are very casual in NZ; when I made the reservation for the following night I asked them what the cancellation policy was. The man on the phone said cheerfully, “Oh, if you change your mind, just ring us up and cancel!” With this task taken care of, we were ready to set out; but as I was leaving the room, I spied the white stone I had left for the maid sitting forlornly on the nightstand. Not having the heart to abandon it yet after all, I slipped it into my pocket as I went out the door. I would have to cull it later! We continued on Route 6; it was still quite deserted this early. We were enjoying the scenery and the solitude. The abundance of beautiful mountain views, spectacular waterfalls, huge majestic trees and beautiful lakes and rivers was amazing; and this was just along the road! If you look at a map of NZ, you will see that there are relatively few roads in most parts of the country, especially on the South Island. There are huge areas of mountains and wilderness that are designated as National Parks and Scenic Reserves, with no roads through them at all. There are large portions of the county with literally no access into them, other than on foot or by helicopter! We loved the opportunity to explore a bit; we stopped whenever we saw something of interest. Sure, we made plans of places to go and things we wanted to do and see, but some of the best moments come from chance discoveries along the way. My personal motto is ‘Invest in the Journey, not the Destination,’ and we were certainly enjoying the journey! We saw a sign that pointed to Roaring Billy Falls, and intrigued by the name, we stopped to investigate. We followed a level trail for a 20 minute walk through a forest that looked like a fairyland. 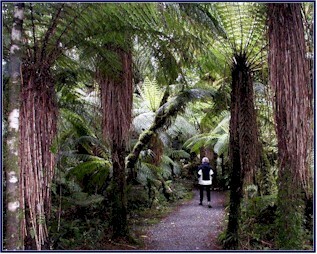 It had a rainforest atmosphere; the woods floor was covered with ferns, the trees had long streamers of moss hanging from them, and rain was quietly dripping from the thick foliage above. It was an enchanting place. Jineen found a hollow tree that was big enough for her to hide inside and completely disappear. If this wasn’t a place for pixies, I don’t know what was! At the end of the path we came to the Roaring Billy Falls; it was aptly named, as the stream fell from a great height with a loud roar. We stood watching the rushing water and feeling the spray of it on our faces. The swift-flowing river that the falls emptied into was a brilliant turquoise; the color was so intense that it seemed unreal. We walked out across the wide river flat, consisting entirely of stones similar to the ones we had seen on the beach the previous morning, but here they had not yet been worn so smooth. An especially pretty green stone joined the white one in my pocket. Not much farther along the road we came to Thundercreek Falls, another beautiful waterfall, very tall and straight. It seemed like a spot of unique beauty; yet as we journeyed on we were to see hundreds of equally spectacular scenes! And again, this was just in the tiny part of the landscape that was near the roads; you could spend a lifetime exploring the wilderness areas. And I would like to! 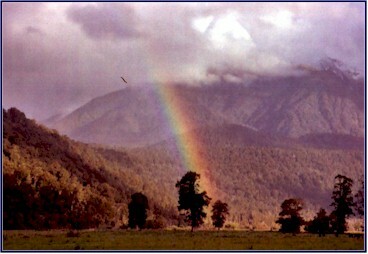 We were following the Haast River, and soon we entered Mt. Aspiring National Park. We passed over a bridge as we ascended the mountain, and a stream leapt furiously down over the rocks. We had come to the Gates of Haast! We stood looking down into the gorge; it consisted of impressive sheer rock faces leading down to the streambed, where green waters cascaded over the boulders with impressive force. It was a lovely spot; we stopped to take some photos, and we might have stayed longer but for the arrival of several tour buses. It seemed that our early morning time of deserted roads was over! Soon we crossed over the Southern Alps Divide; the road went winding down the eastern side of the mountains. The scenery changed; we saw green grassy pastures on the floor of the valley, and the mountains were more in bush rather than rainforest and large trees. It was much drier on the east side of the divide, and the sun was shining! As we continued south, the high Alps marched to our right, the majestic peaks crowned in snow. We passed Cameron Flat, a little picnic and camping area with a splendid view of a row of snow capped mountains: Castle Hill, Mt. Stuart, Mt. Cameron, and Mt. Cross. 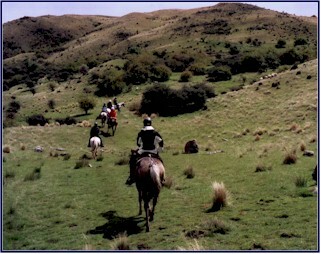 We felt that it might be really fun to see some of the NZ countryside by horseback, so we booked a trail ride with Back Country Saddle Expeditions. This proved to be an interesting experience! 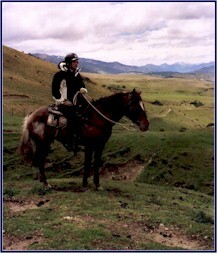 When we arrived, Debs, our guide, was tacking up the horses. They were mostly appaloosas, and they used western saddles. We had hoped that there wouldn’t be a lot of people on the ride, but when we arrived we found that she had booked eight others to go out with us, most of whom had no riding experience. Since we had told her that we were expert riders and she was a bit short on trail horses, she decided to use this as an opportunity for one of her greener mounts to gain experience. So I got to ride an appaloosa mare that had never been used for clients before, and had never been ridden by anyone other than Debs. I didn’t mind riding a green horse; but I didn’t know the thing was going to be suicidal! Jineen’s horse was named Chocktaw; but I blotted my horse’s name from my memory. Jineen’s horse went along steady, docilely following the horse in front of her, doing whatever she was asked and never putting a foot wrong. My horse, on the other hand, took every opportunity to try and kill me. 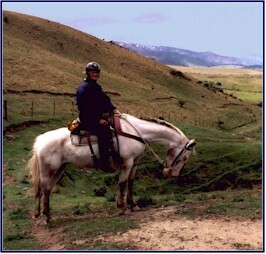 I could cope with the bolting when I attempted to mount or dismount and the spooking whenever I moved in the saddle; I didn’t even mind the fact that she resisted my efforts to steer her. 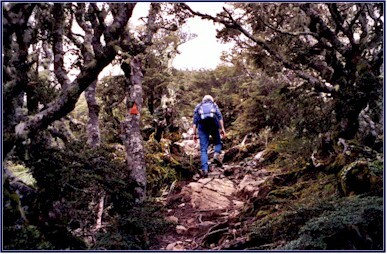 But when the path goes along a narrow ledge with a large drop-off beside you, it is desirable to be on a sure-footed mount that follows the trail carefully and without argument. But my horse was so busy chucking her head, going sideways, and trying to run up on the tail of Jineen’s horse in front of her (who had already kicked her in the face for this transgression once!) that she was constantly stumbling and tripping; and whenever I gave her a loose rein she would veer alarmingly towards the brink of whatever ledge we were near. Phyllis and the horse from hell. We went for a two-hour ride, and despite my ill-favored mount, it was fun. Or at least interesting! Due to the inexperience of the other riders we went fairly slowly, but the scenery was lovely and it was great to get a chance to ride through the valley. When we returned to the stable, Jineen and I helped Debs untack and care for the horses; we fed them their dinner in nosebags. A sudden rainstorm blew up just as we returned to the car, but it was over by the time we were ready to embark on our next adventure; another indication that our trip was charmed. We hadn’t gotten wet yet! From a viewpoint during our ride, we had noticed a small roadway winding up the mountainside on the opposite side of the valley; it appeared to go all the way to the top. 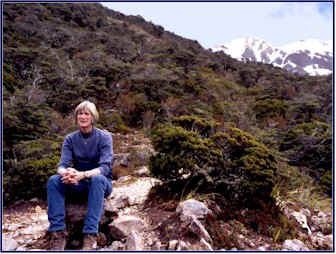 We asked Debs about it; she told us it was the road to the Waiorau Snow Farm, which in winter is a cross-country ski area. It looked intriguing, just the sort of off-the-beaten-path exploration that we liked. 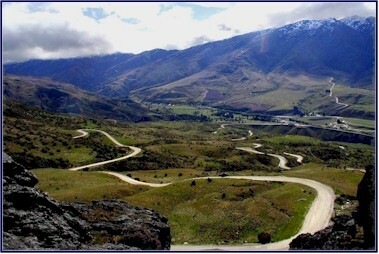 It is 13 kilometers of zig-zagging bumpy road to the top of the mountain. It is unsealed (gravel), and very steep and winding; I started up slowly; and with the hairpin turns on very steep slopes, I was soon going even slower. Each kilometer was marked with a small sign. The higher we climbed, the greater the precipice at the edge of each turn became. No guard rails, of course. With each successive switchback I became more nervous; soon I was barely crawling, hands clamped white-knuckled to the steering wheel as I hugged the upward side of the road regardless of whether I was on the right or left of it. Logically, I know that I am no more likely to run off the road at the top of the mountain than I am at the bottom, but that’s not the way it feels! I just don’t like heights. Bungy jumping was definitely out! Debs had told us that each Easter they have an auto road rally race there; it is called the ‘Race to the Sky,’ which seems a very fitting title given the nature of the route. It must really be something to see; for a normal driver it takes about 40 minutes to drive to the top, and during the race they cover the distance in 8 minutes! We didn’t see any people or cars on this road; only sheep. I suppose this shouldn’t seem surprising for a country that is home to only three and a half million people, and around seventy million sheep! Being late spring there were new lambs everywhere, they were very cute. We passed one ewe in the road frantically trying to get to her lamb, which was on the wrong side of the fence. We felt sorry for the poor baby; it was running up and down the wire mesh fenceline trying to find a way through to its mother, but to no avail. At one point we looked up and saw a man standing on a rock outcropping far above us; not moving, just watching. It was a little spooky the way he was just standing there; but presently we realized that it was not a man after all, but a statue! When we finally got to the summit, it was snowing like mad. The air was very cold and the wind was whipping; this put an end to the thoughts we had been entertaining of going for a tramp along the top. The sun had been shining when we looked up at the mountain from below, but the very top of it had been obscured by clouds, as is often the case with the higher peaks. We hadn’t realized that it would be snowing when we ascended into that cloud! The mountain top, which had looked like a narrow ridge from below, actually flattened out into a broad plateau, with a hidden valley in the middle of gently sloping hills; a perfect place for cross-country skiing. We were surprised to see a lodge up there, as the road had been so deserted. But come to think of it, the lodge was deserted too! Though we found the doors open and a few cars in the parking lot, no one was about and we didn’t see a soul. We drove a little way back down the precarious road, out of the snow cloud, and found a nice spot with a panoramic view of the valley; a perfect place for Happy Hour! We had crackers with apricot chutney, and finished off the Stoneleigh. A little further down, we stopped to investigate the statue. We parked the car and walked down a fairly short but very steep path to the rock outcropping. A small stone platform was built there, and on it stood a life-size bronze statue of a man, hands on his hips, gazing out over the valley. It was evidently a memorial; a plaque identified the man as ‘Possum Bourne.’ He had a smile on his face and a far away look in his eyes; it was very compelling. We didn’t know who he was or how he died, but it seemed evident he was connected with auto racing; on his jacket were logos for Subaru, STP, and Pirelli, as well as several others that were too high up to read. We were fascinated by the mystery of it; we wanted to learn more about this man, and how he got his unusual name, and why his memorial stood high on this mountainside. Heading back up the steep incline to our car, we were soon quite out of breath; I could feel my heart pounding from the exertion of the climb. Oh yeah, that is why we usually have happy hour AFTER walking up mountainsides, not before! Continuing down, we came upon the ewe that was separated from her lamb; they still had not been able to resolve the problem. 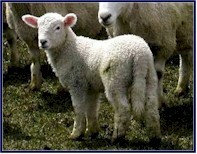 The lamb was quite young, and it seemed very scared and hungry. We felt that rescue was in order! I worked the gate to keep the other sheep from escaping while Jineen herded the lamb; soon we were able to maneuver it through the gate and it was reunited with its mother. Both mom and baby were very much relieved, and feeling a warm glow of Good Samaritanism at our accomplishment, we drove on. Back on the main road, we found yet another lamb separated from its mother. A little more sheep herding, and we were able to get the ewe to clamber over the fence to her baby. We were getting to be quite expert in the field of ovine reinstatement! It seemed to be our evening for rescuing animals! Heading back to Wanaka as evening came on, I was driving along at a pretty good pace when I saw something that caused me to slam on the brakes and come to a screeching halt; there in the middle of the road was a hedgehog! He was tiny; he would easily fit in the palm of your hand, and he was incredibly cute. 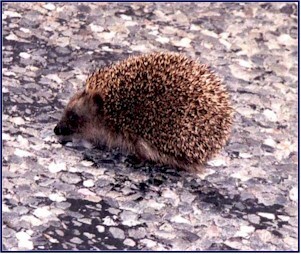 He seemed a bit confused and scared, and as he had a wobbly gait and moved slowly we were certain he would be run over by a car. 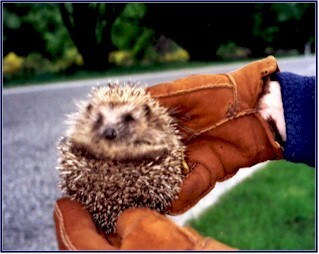 After locating some gloves as protection from his prickly quills, Jineen picked him up and transferred him out of the roadway to the safety of a grassy field nearby. She was somewhat concerned about whether he would bite, another reason for the gloves, but he was very sweet and just curled up into a little ball in her hand. We stopped in Wanaka at a wine shop and finally bought a bottle of Cloudy Bay Sauvignon Blanc, the first we had seen since we passed it up at the beginning of the trip. We found a secluded spot by the shore of Lake Wanaka and indulged in a second Happy Hour. We thought it to be quite excellent, the best we had enjoyed so far, and gave it four stars! After several glasses, I started to feel like I could do anything. Maybe even bungy jump. But how to convince Jineen?! ?